I've been wondering how can I assign to multiple keyboard shortcuts to do the same action? More specifically, I want to be able to change my volume with both my headset buttons and my keyboard. I'm able to change the volume with just one at the time: with the one I define in the 'Keyboard shortcuts' application. Is there any way? I use xdotool key --clearmodifiers XF86AudioLowerVolume (and XF86AudioRaiseVolume) command instead of amixer set 'Master' 10%+. The only difference/downside I notice is that even Repeat Keys on Typing tab is set this doesn't apply to this custom shortcut. However, I wasn't able to do same things like use Fn+F7 to turn off my screen (xset dpms force standby). It doesn't detect it as a shortcut event. You could probably use xmodmap to reassign the buttons on your headset to the same as you use for your keyboard. You can assign multiple keyboard shortcuts (keybindings) for the same command using gsettings command line. 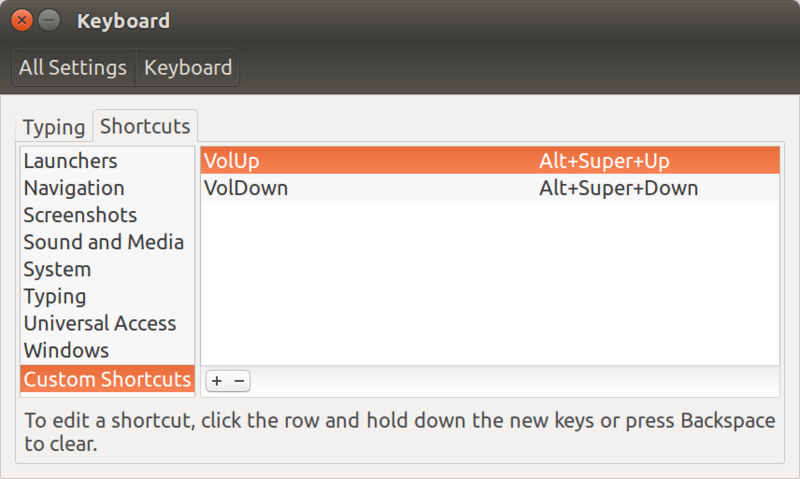 One important thing to know is that Ubuntu 18.04 Settings GUI only shows the first keybinding for a command, so if you have multiple keybindings for a command, the others won't appear in Settings. You can use gsettings to all the keybindings. Let's say I want to add another keybinding for "Switch to Workspace 1". The default for me was Super+Home, but I want to add a second keybinding Ctrl+1. # set multiple keybindings for "Switch to Workspace 1"
gsettings set org.gnome.desktop.wm.keybindings switch-to-workspace-1 "['<Super>Home', '<Control>1']"
Now you can use either Super+Home or Control+1 to Switch to Workspace 1. Remember, you will only see the first one Super+Home in the Settings GUI, but it will work! Not the answer you're looking for? Browse other questions tagged keyboard shortcuts or ask your own question. How to remap keyboard shortcuts in Unity Launcher? is there a way to customize keyboard shortcuts in LxTerminal?